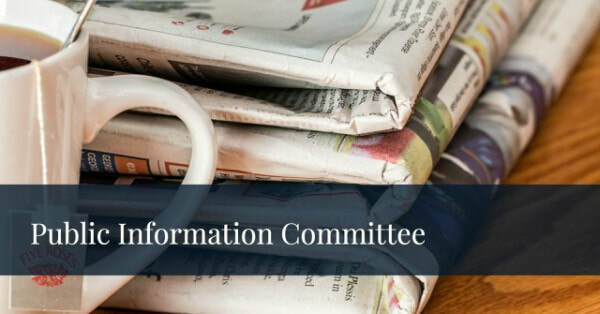 ​The purpose of the R2 Public Information Committee is to carry the message to the compulsive overeater who still suffers by encouraging, supporting and developing public information efforts in the Region 2 Intergroups. Increase public awareness of the Overeaters Anonymous program of recovery throughout the Region. Provide support which encourages the development of local public information efforts within the Region. Organize and support Regional public information activities which, because of their nature, are beyond the scope of what one Intergroup could accomplish by itself, or which require the involvement and support of two or more Intergroups. Establish annual public information goals for the Region and report at each assembly on the actions being taken to achieve those goals. Recommend to the region an annual budget in support of the Region’s public information activities and report to each assembly on the usage of the funds which are approved. Follow prepared agenda for each committee meeting and communicate between committee meetings.